The following are court results from Hastings Magistrates’ Court which covers the Eastbourne area from May 4 - May 11. Branislav Balaz, 47, of Upper Grosvenor Road, Tunbridge Wells, pleaded guilty to failing to provide a breath specimen when required to do so by police. He also pleaded guilty to driving while disqualified and driving without insurance. The offences took place at Royal Parade, Eastbourne, on April 17. He was sentenced to 12 weeks in prison, suspended for two years. The court also made a community order with a requirement of 200 hours of unpaid work and banned him from driving for three years. Jon Melbourne, 49, of Elms Avenue, Eastbourne, pleaded guilty to stealing a pair of jeans worth £14.99 from Blue Inc, at the Arndale Centre, Eastbourne, on March 28. He also admitted being in breach of a conditional discharge imposed for shoplifting on March 17. He was fined a total of £80. Lee Midmore, 42, of High Street, Tonbridge, Kent, pleaded guilty to assaulting a woman and to a further charge of threatening behaviour. The offences took place at Church Lane, Eastbourne on January 15. He was fined £80. Ryan Warner, 24, of Maywood Avenue, Eastbourne, pleaded guilty to stealing bottles of alcohol, worth £35, from the Co-op in Lindfield Road, Eastbourne, on December 19. He was given a 12 month conditional discharge and ordered to pay compensation of £35. Perry Barrett, 26, of Wakehurst Road, Eastbourne, pleaded guilty to driving a Vauxhall Astra on Brampton Road, Eastbourne, on February 14 with cannabis in his bloodstream. He also pleaded guilty to driving with no insurance and to driving with no licence. He was fined a total of £400 and banned from driving for 16 months. Fiona Gray, 30, of Langney Rise, Eastbourne, pleaded guilty to making off without paying for a £27 taxi journey. 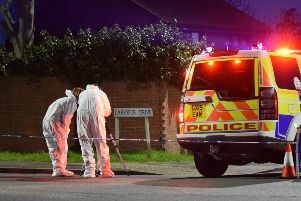 The offence took place at Etchingham Road, Eastbourne, on February 6. She also pleaded guilty to stealing perfume sets, worth £135, from Boots, at the Arndale Centre, in Eastbourne, on December 5. She was given a 12-month conditional discharge and ordered to pay compensation of £27. Jenna Lonergan, 29, of Hurst Lane, Eastbourne, pleaded guilty to driving while disqualified. The offence took place on November 26 at St Annes Road, Eastbourne. She also admitted being in breach of a suspended sentence imposed by Lewes Crown Court, in June last year, for theft. She was committed to Lewes Crown Court for sentencing. Dermott Hinze, 28, of Croxden Way, Eastbourne, pleaded guilty to being the owner of a dog which was dangerously out of control at Mallard Close, Eastbourne, on December 29. The court ordered that the black and white Staffordshire Bull Terrier, called Snoop, be destroyed unless an appeal is made within 21 days. Magistrates also made a community order with a requirement of 100 hours of unpaid work and ordered him to pay a total of £1,247 compensation. The court said the reason for the destruction order was due to the nature of the offence and failure to comply with a previous voluntary agreement. Amie Jackson, 21, of Ketcham Close, Westham, Pevensey, pleaded guilty to driving a Ford Focus, at Seaside Road, Eastbourne, on March 18, with cannabis in her bloodstream. She was fined £120 and banned from driving for one year.